If there were a holy trinity of foods, pizza would occupy the top spot for me. It’s entwined in my DNA. It’s something I enjoy making and something I enjoy eating. While I can get out of control eating any delicious food, pizza is a special beast to me, and, if I want to maintain my rotund figure, I have to limit my intake otherwise I start craving everything. Pizza is the only food that does that to me. In his article, he says a lot of great things, including: “anyone who says that money cannot buy happiness has clearly never spent their money on pizza” and “it’s healthier to be truly happy than it is to painfully censor yourself and your passions”. His sage-like wisdom couldn’t have come at a better time. Even though I’m currently in the middle of a stringent food and exercise plan and way too busy to make the commitment this year, part of me really wanted to be on the judging panel again. While it had its frustrating moments, judging the tournament in the past was lots of fun. So when Mary from All Over Albany invited me to be in attendance at the 2014 Tournament of Pizza finals public event, I really couldn’t say no. 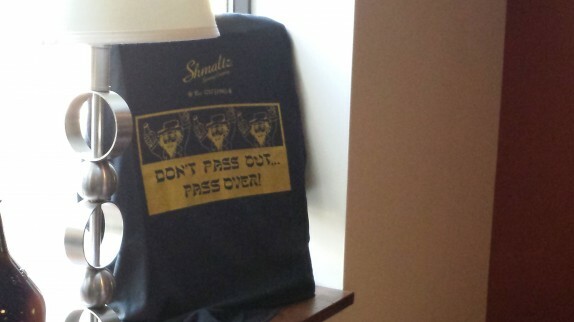 It was at a place called Shmaltz Brewing Company in Clifton Park. Each guest got a goodie bag with tickets for the four slices of pizzas from the two finalists, two samples of beer, and a cider donut. I made sure my executive consultant, MetalFrog, could come with me. 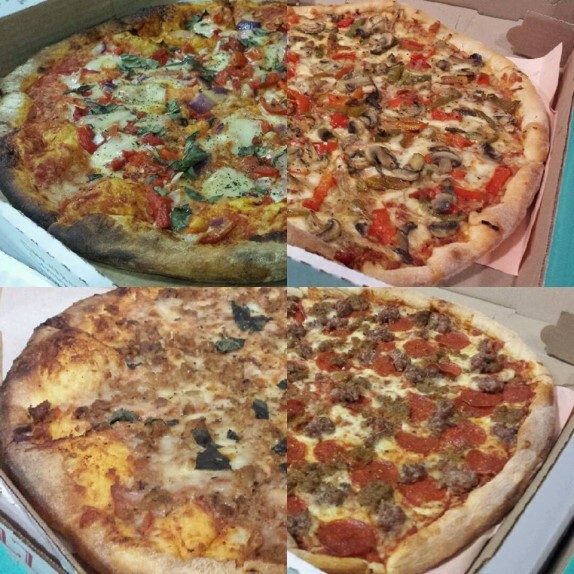 Let’s talk about the pizzas, shall we? It sounds like each shop in the finals, DeFazios from Troy and Marino’s from Schenectady, was told to prepare their best veggie and meat pizzas. The easier pizza to compare was the veggie pizza. The crusts of both shops are markedly different. 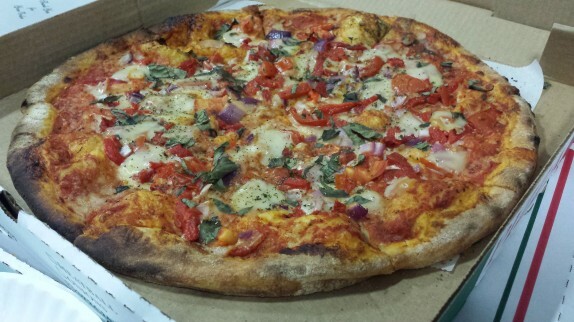 Defazio’s uses a hearty dough that’s slightly thicker and a little more bready than a classic NY style crust. Throwing the pizza in the wood fired brick oven, the crust picks up a char that can’t be achieved in a standard pizza oven. 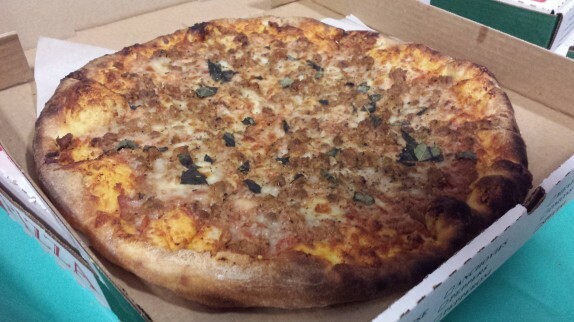 Marino’s uses a more manageable crust that is spread nice and thin to afford a crispy bottom and edge. Theirs is cooked in a standard pizza oven. Both crusts were very good, and across both pizzas, I scored them evenly. Defazio’s crust was inherently more flavorful, but there were spots where too much char was picked up (char = good, burn = bad). Marino’s crust was crisper. I tend to be tough on veggie pizzas, mainly because they’re difficult to execute. Defazio’s veggies were on the right track, and I suspect that the wood fired oven helped to roast the zucchini, red peppers, and red onions on top, leading to a less watery top that didn’t meddle with their superior cheese which included smoked mozzarella; the torn basil on top helped bring some brightness. 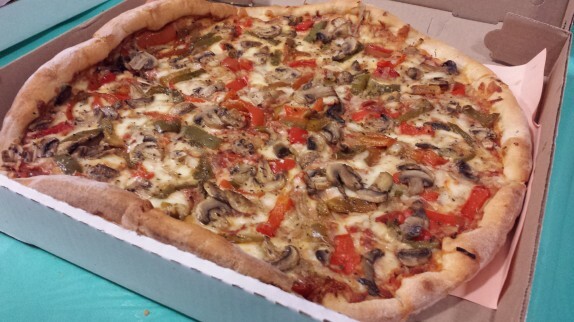 Marino’s mushrooms, peppers, and onions tended to weigh the slice down and leave way too much water atop the cheese. Marino’s veggie slice was like a C, Defazio’s was like a B-. The crusts each shop used were the same as for the veggie pizzas, but, since the meat toppings were precooked, they were probably baked a little less. While I was eating and scoring, I was under the impression that Defazio’s pizza was a simple sausage pizza. I was a little puzzled when I found out there was supposed to be Bolognese sauce comprised of pancetta, pork, beef, and wine on top. I would be amazed if anyone could truly detect any of that. All I tasted was sausage. 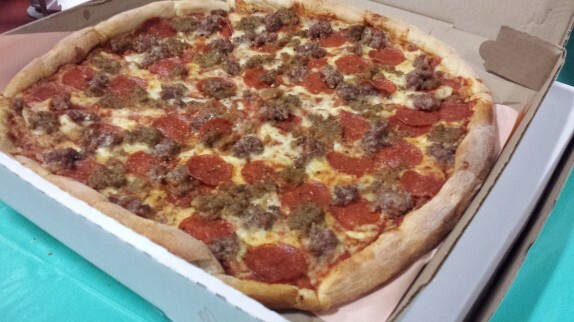 It was rich and somewhat flavorful, and the cheese played well into the pie, but the edge definitely went to Marino’s, whose pizza featured sausage, sliced meatball, and (maybe a little too much) pepperoni. Perhaps it has to do with the sheer number of pizzas that needed to be prepared, but why Defazios didn’t send their incredible meat lovers pizza is beyond me. Defazio’s pizza bolognese was a C; Marino’s meat lovers was a B.
Marino’s had a slight edge overall, but I don’t think any of four slices in the finals were particularly outstanding. That probably had to do with the fact that the pizzerias are 16-20 miles away from the place they were consumed and that enough pizzas needed to be made for a large number of people. AoA did a great thing starting the annual Tournament of Pizza 6 years ago. I think it’s really helped a lot of their audience and community hone in on the quality pizzas in a land of mediocre pizza. They say it’ll be the last Tournament of Pizza, and it probably was the right time to step away, but like Andrew WK said in his article, “when you love something with all your heart, like the way you love pizza, it becomes an inseparable part of your being — it’s always with you, even when it’s not directly in front of you”. The same is true for All Over Albany’s Tournament of Pizza.